Faster than Light is a ‘spaceship simulation roguelike-like’ by Subset games. After playing it for a while, I felt like it really needed some way of creating your own ships! 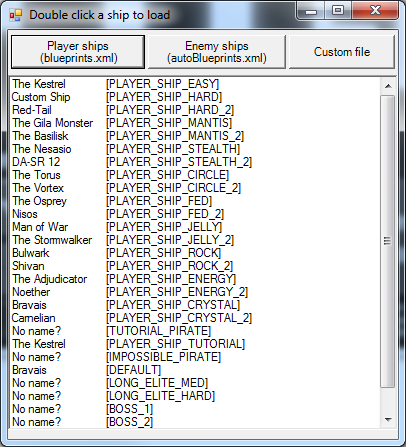 I did some reasearch on how the game stored the ship data, and how the ships were created, and decided that an easy to use tool for creating the layout and xml files for the ship was really needed! And so, after much reverse engineering, experimenting, and confusion, this was the result! When you first run FTLEdit, you’ll need to configure it. 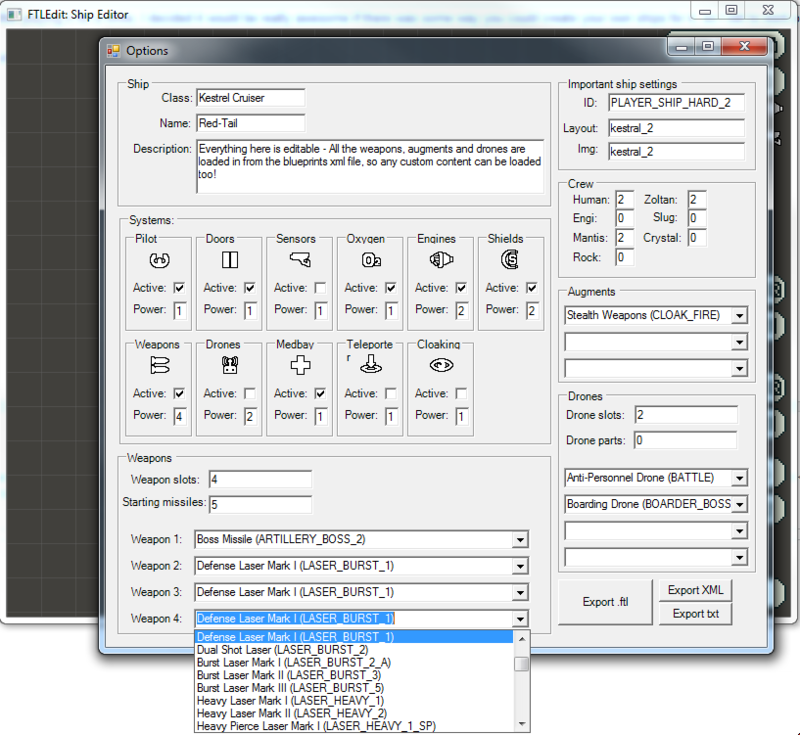 It requires a location where the data files for FTL are extracted to. Click the options button in the top right of the main window. Here you’ll need to configure the paths to where you have data.dat extracted to, and resource.dat extracted to. 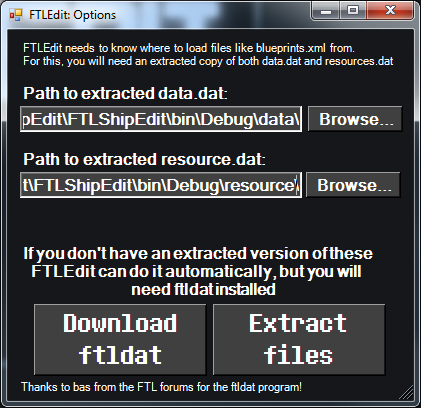 If you don’t already have them extracted, click the download ftldat button to download the installer for ftldat, and then the extract files button to prompt you to locate the files, then extract them for you. This should take a small amount of time. If two cmd windows pop up and instantly disappear, something went wrong – Please let me know if this happens! Once you have this done, FTLEdit should now be set up! These settings should be saved the next time you run the program. To add a room, click the add room button, or press F1. Left click to place the room, then right click and drag to resize it. To move an existing room, just click and drag it. To add a door, click the add door button, or press F2. Space bar will rotate the door (I’ll probably change this to a more intuitive system later). To move the bg, click the move bg button. You can now roughly place the bg using the mouse. Once you click, you’re able to fine adjust the position using the arrow keys. Once you have where you want it, press enter or click again. To change the majority of options, and export the ship, click the options button in the bottom right. 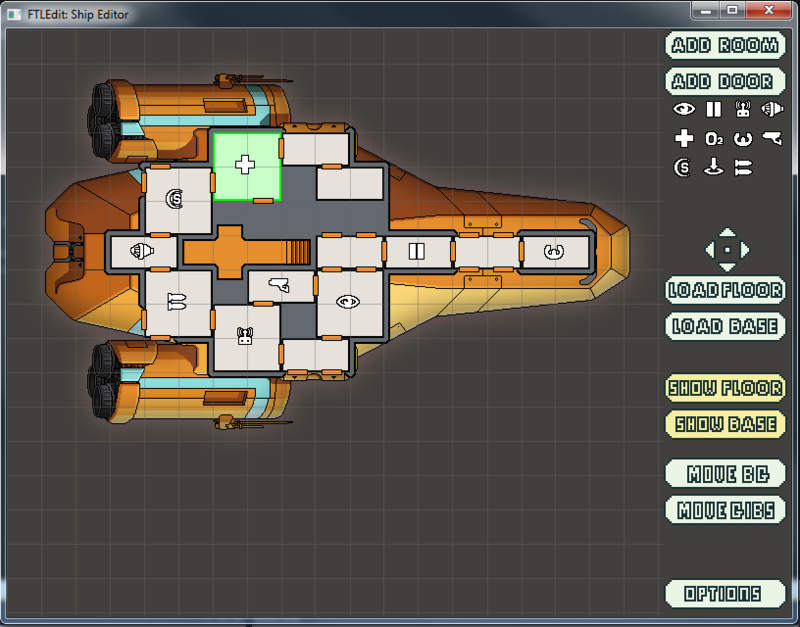 Here you can change all of the main ship properties, like weapons, augments, drones, systems etc, and export the ship.